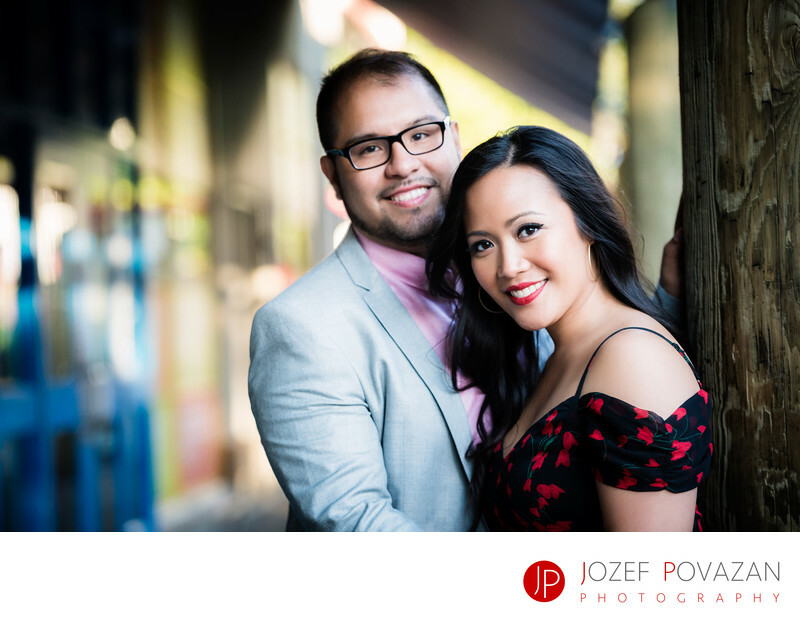 Granville Island pre wedding pictures romantic location - Best Vancouver wedding photographer Jozef Povazan Photography studio. Granville Island pre wedding pictures romantic location. There is not so many weddings happening at the Granville Island in the heart of Vancouver but when it comes to engagement stories, then this is a perfect place for it. Narrow back-lanes with funky colours on the walls, shiny shopping windows with weird items in it, restaurants and market place which brings vibe to this place so well. We took an Aquabus boat across the False Creek to get here and then we could explore this place with some creative pictures in mind. To me it is all about the couple being themselves so their story flows, and then I look for an interesting light around to bring the colours and mood to the life. Guys dressed up very classy way and matched together beautifully. Their hand were touching and holding all the time and so important connection and chemistry was between them from the very beginning. Camera liked them a lot, their strong characteristic features were well balanced and you could see in their eyes they had a great time together. We even had a chance to get some golden hour sunset light for couple portraits before we moved to the beach for the dusk images. Great evening spent around great people. If you love creative and unique portraits from weddings and engagements then feel free to reach out to me. I would like to know what your story brings in front if my camera. My name is Jozef Povazan and I am photographer.